In the first version of Shadow Election (trialed in the Finnish 2011 parliamentary elections) we used a question and answer model that proved to be very effective: advocacy groups (e.g. environment, social entrepreneurship, automobile, etc) sent questions to the candidates. The candidates' answers were then embedded in a customized version of Shadow Election hosted on their own websites. Their motivated members were then able to directly rate the answers, and the results were aggregated in the central (hub) version of Shadow Election – alongside the questions and answers from other interest / advocacy groups. In the Finnish and US 2012 presidential elections we trialled a different version that used existing online political content (particularly video) as the ratable element. 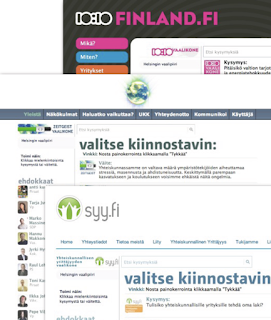 In Finland this proved to be popular, and user generate footage of candidates generated particular interest. We also added a virtual vote "live" poll that garnered even more interest. 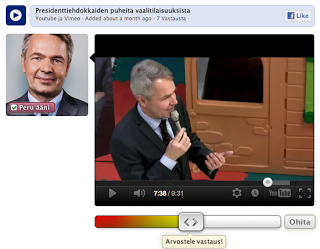 Shadow Election also rode the wave of the surprise last minute, social media driven support, of outsider green candidate Pekka Haavisto (seen in the screenshot below). And we ended up with a potential reach of around 30% of Finnish Facebook users. In the US presidential election we tested a new Pinterest-inspired layout, and continued with the use of existing online video content (as we don't yet have the influence to get direct answers from the main candidates). The overriding mainstream media support of the two main parties meant that there was little interest from the Obama and Romney supporters for an unknown service like ours; however, we did gain considerable interest from the next most credible candidates, Gary Johnson and Jill Stein, and their supporters — who in the end took over a million popular votes. This was only natural as they were excluded from meaningful participation in the main stream media debates. Now we are going back to the Q&A format for the Kenyan March 2013 presidential elections (potentially together with some existing online content). The current Kenyan administration has shown considerable willingness to embrace technology to help make government more transparent and accountable, and we are excited to be working with local Kenyan partners Mzalendo and Kenya Decides – who will also be hosting the service on their websites. We are currently finalizing the letters and questions that we will be sending out to all the Kenyan candidates so that we have fresh and original content for you to rate when we launch on 11 January.